15 February 2018 Radio concert LPs have been added to the Live Discography. These live recordings were distributed to radio stations for later broadcasts. In some cases, the shows were originally broadcast live. In order to comply with time constraints, some songs that were played live were left off these releases. The recordings listed reflect official releases and do not include the many botleg LPs available. Additions to the list are always welcome. 16 March 2016 Project Q has been completed. Text and photos in Programmes and Fanzines have been indexed and are fuly searchable. The Search page now includes the ability to narrow searches by category and a companion page has been created that includes search terms to enable even more precise searches. Continous improvement to keywords and indexing is ongoing. 17 December 2014 All new menu navigation on the top of every page. 21 November 2014 Lyrics and discography for The Skids have been added (finally) to the site. There are numerous gaps, so if you have can assist, please let me know. (Click here). Special thanks to Robert Oliver, Michael Wallack, Oliver Hunter, Callum Kay, Cob Harrower and numerous others for doing most of the ‘heavy lifting’ before me. 2) Short URLs have been added to each page. (I have finally found a good use for the old URL of this site.) This allows linking to a page without using up too many characters should that be an issue. Rather than assign each page a string of ‘random’ characters like other URL shortening services, I have given each page a semi-intuitive URL. Genrally, songs will have only small letters and singles, albums, videos, etc., will have capital letters. 5 September 2014 Improved 'hover' function implemented throughout the site. Hover your mouse cursor over an icon and a larger version will appear. 17 April 2014 Each page now has this icon. Click on it and you will be taken to a random page on the site. 20 September 2013 Issues of the fan magazine ‘All of Us’ posted‘ Inwards’ and ‘We Save No Souls’ posted. 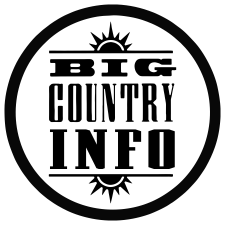 1 June 2009 Quick links to most Big Country releases are available in the collage on the home page. 22 March 2009 With the addition of the pages for tabs and chords, the site has now over 1000 pages. 22 March 2009 For the guitar playing enthusiast: Guitar tabs and chords for Big Country songs have been been gathered from across the internet and brought here. 23 July 2008 Improved Search feature added. 27 June 2008 Most entries in the Discography now have Variations pages, which show additional graphics of the release and, where applicable, a comparison with similar releases, including posters and postcards that have been included in releases. Click on the camera icon wherever you see it. In addition, most of the graphics have been rescanned. 15 September 2007 New page for the forthcoming live release 25 Twenty Five Live, recorded at the Thekla in Bristol on 18 August 2007. 10 September 2007 Big Country’s first single in seven years, You Lift Me Up (which was initially called ‘The Highest Mountain’) released on the band’s MySpace page. 17 August 2007 New tracks! New tracks! New tracks! New tracks! New tracks! 1 August 2007 New site address!!! www.bigcountryinfo.com See ‘Introduction’ for details. 1 June 2007 The way variations of songs has changed a bit. Click on Info for full details. In short, Studio tracks are in Dark Blue and Live tracks are in Aqua. References to digital sources (CD & DVD) in normal type, while analog sources (vinyl, cassette, VHS) are in italics. 7 March 2007 The PDF Edition of Michael Wallack’s Book of Lyrics (v2.1) and Discography (v1.11) (on which this site is based) released on his website. 27 February 2007 Video entries have been added to each song’s discography. 2 January 2007 Thumbnails of albums have been added to lyrics pages next to the discography listings. 24 December 2006 New page added for ‘Happy Christmas (War Is Over)’ as performed by Tony Butler and accompanied by daughter, Joella. The track can be heard for a short time on the Big Country MySpace page. 19 December 2006 New page added for the Greatest Hits CD Included as an insert in the Sunday 10 December 2006 Scottish edition of the News of the World. Heart of Wonder & Falling. 12 November 2006 Pages added for the upcoming FourGoodMen CD “Heart of Winter” and the new tracks ‘Heart of Wonder’ and ‘Stars Will Fall’. 10 November 2006 New section of Official Publications created. Included are tour programmes, books and Country Club magazines. 23 August 2006 Covers of ‘Chance’ and ‘Harvest Home’ by John Davey are posted in the Tributes section. 22 June 2006 Pages added for “FourGoodMen”, including their two new songs, ‘Kiss Cool’ and ‘Falling’. 5 June 2006 All sorts of new releases by artist covering Big Country songs under ‘Tributes’. 12 May 2006 Solo listings have been revamped to allow easier navigation. You can browse the listings by each solo artist/group or all solo work alphabetically. Links on each page allow one to switch between views at any time. Added to the solo listings are the works of Tony & Mark with ‘On The Air’ as well as a CD Mark created with Simon Townshend. Hopefully, I will be able to the works of ‘The Skids’ soon, but there are still too many tracks yet to be transcribed to make the inclusion presentable. ALSO, a separate set of pages for Instrumental tracks have been created. 3 May 2006 Bruce Watson has re-joined fellow Big Country alumnus, Mark Brzezicki in Casbah Club. Read about it at www.casbahclub.co.uk. 9 March 2006 Transcripts of interviews released with King Biscuit Flower Hour Presents and Hold The Heart are now online. Other minor corrections here and there. 21 December 2005 Lyrics for ‘new’ songs on Rarities VIII added. Let me know if you have any corrections. 30 August 2005 The shows listed in the ‘Trading Post’ section now have the sets listed. Next on the to do list: Each track’s page listing at which gigs they were played. 1 August 2005 The ‘Special Guests’ section is up. 29 July 2005 The discography now has the vinyl collection included. It has been slightly rearranged to accommodate this. The ‘Tribute’ section is now up as well. 22 July 2005 Video section is now up!